Building a wall of voter suppression as a model for the nation. Someone needs to knock it down. Photo credit: DonkeyHotey / WhoWhatWhy (CC BY-SA 2.0) See complete attribution below. When Americans head to the polls next month, an untold number of them, perhaps even millions, will only be able to exercise their right to vote because of the tireless work of activists who dedicate their lives to protecting US democracy against all enemies, foreign and domestic. And because there are so many threats, these voting-rights advocates constantly need to be on guard. They highlight the vulnerabilities of voting machines, sue states over laws that make it more difficult for certain people to vote, fight unjustified voter roll purges, take governments to court for not making elections transparent and secure, help those in need to get the required ID, and work to give disenfranchised felons a second chance. They don’t do what they do because they expect people to thank them. In fact, most of the affected voters wouldn’t know whom to thank — or that somebody worked behind the scenes to make it possible or easier for them to cast their ballot. They also don’t do it because they want publicity. In spite of the immense importance of their work, it’s probably fair to say that, at any moment in time, more journalists in the US are covering one of President Donald Trump’s tweets than the vulnerability of US elections or voter suppression. And that’s where we come in. Regular readers of WhoWhatWhy know that we have dedicated a large share of our coverage to this issue. We believe that all eligible Americans who want to vote should be able to do so with minimal obstacles placed in their way. This isn’t, or at least it shouldn’t be, a partisan issue. And that’s why we are highlighting the many problems that continue to plague US elections and pointing out the people who are responsible for them while also profiling the activists and groups who are doing something about it. In recent weeks, with the midterms fast approaching, we kicked things up a notch by launching a one-of-a-kind initiative: our “Protecting Our Vote” project. In what has been an unprecedented expenditure for WhoWhatWhy, we have put reporters on the ground in various parts of the country to comprehensively examine the status of voting rights in the US. We are concentrating much of our efforts on the South because of the region’s sordid history when it comes to disenfranchising its African American population. This year, there may not be a better race to illustrate the many problems plaguing US elections than Georgia’s gubernatorial contest, which is why you will see a lot of stories from the Peach State. But that doesn’t mean that the issues we cover are exclusive to Georgia — or the South. What makes the race between Republican Brian Kemp and Democrat Stacey Abrams so intriguing is that the latter is trying to become the first female African American governor in US history, while the former, as Georgia’s Secretary of State, has been in charge of Georgia’s elections since 2010. That’s why we will closely examine Kemp’s record. Has he adequately protected voting equipment from outside interference? Over the past eight years has voting become easier or more difficult for Georgians? Or easier for some people and more difficult for others? Is the Election Day experience of an affluent person the same as that of somebody who is struggling to make ends meet? Does skin color still matter in Georgia’s elections? Are eligible voters being denied the right to vote? If so, who are they and what are their stories? And, ultimately and most importantly, if there is any kind of inequality will it be the difference between having the first female African American governor in US history or the 2,398th governor who isn’t a black woman? Obviously that’s not the only state or contest we will cover. But the main question we want to find an answer to is always the same: Are the elections that determine who will control Congress or state governments fair and, if not, will that affect the outcome of tight races around the country? So with just over four weeks to go, we invite you along for the ride. 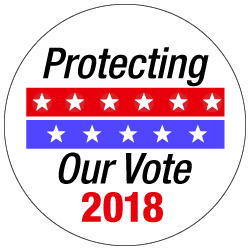 We hope you will do your part by sharing our work, telling people about the “Protecting Democracy” project and, if you have a tip regarding problems with fair elections in your home state, please let us know. 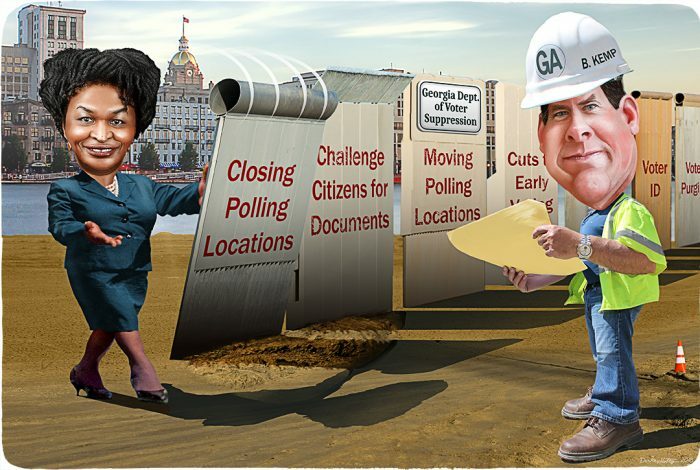 The cartoon above was created by DonkeyHotey for WhoWhatWhy from these images: Stacey Abrams – caricature (DonkeyHotey / Flickr – CC BY 2.0), Brian Kemp – caricature (DonkeyHotey / Flickr – CC BY 2.0), border walls (U.S. Customs and Border Protection / Wikimedia), construction worker (Elvert Barnes / Flickr – CC BY-SA 2.0), and Savannah (Scott Oves / Flickr – CC BY 2.0).